Built as a wedding gift, this 1928 Dutch Colonial home passed through five families before it was purchased by Bob and Pat Elenbaas. The innkeepers' warmth matches the inviting decor. Period furnishings, original art, Old World lace and beautiful comforters contribute to the charm of this Bed and Breakfast. Travelers are always welcomed and served a delicious full breakfast. There are five guest chambers, all with private baths,some with whirlpool tubs for two and fireplaces. The individually decorated rooms offer queen or king beds, TVs, and in room phones. The guests' chambers are augmented by a cozy solarium, open porch and a common room appointed in Queen Anne furnishings. The scenic shores of Lake Michigan are located fifteen minutes from the Inn. We are also near Hope College, the unique downtown shopping district of Holland, outlet shopping mall, and many Dutch attractions. Gift Certificates Available. "Our home is your home." 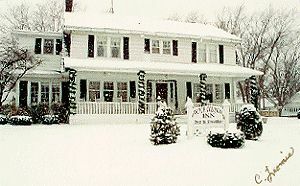 This and other Grand Rapids Bed and Breakfast Inns can be found here in The Register.